We have different expectations of safety and different definitions of ‘dangerous’ when speaking about Mexico. Do people get robbed in Oaxaca? Yes. Do people get robbed in your hometown. Yes. Are there murders in Oaxaca? Yes. Are there murders in your hometown? Yes. If the existence of crime is defined as dangerous, than yes, Oaxaca is as dangerous as your own hometown. There is an unrealistic expectation of absolute safety when we go on vacation, yet there isn’t any place in the world with a 0% crime rate that has a population of more than one person. I have survived the last 10 years living in Mexico full-time, so I am confident that you can survive a 7-10 day vacation in Oaxaca. The biggest safety concern I have in Oaxaca is having my cellphone stolen. I have zero fear of being murdered or assaulted in Oaxaca, or anywhere else in Mexico. I can deal with the occasional stolen phone, but that hasn’t happened in years because I have learned how to be more aware of my surroundings. If you ask a local ‘is Oaxaca dangerous?’, you will probably be met with an eye-roll, chuckle, or even a full-blown laugh in your face. We wouldn’t live here if it wasn’t safe! Even in other parts of Mexico with high crime and violence, tourists and foreigners are rarely the victims (of violence). Take away cartel on cartel violence and Mexico becomes much safer than the United States. A foreign tourist is more likely to become the victim of a violent crime in the U.S., and your chances are slim-to-none if you are not involved in the drug trade while visiting Mexico. A victim of crime is another story. Tourists many times leave their commonsense at the border. Anywhere in the world, whether your hometown or in Mexico, it’s not recommended to flash money around, we recommend keeping your wallet in your front pocket, women should have purses that can go over the shoulder (if you must carry one, but I recommend against this), keep purses zipped up, not hanging open. Don’t leave valuables unattended on the beach. You know, commonsense. You should be mindful but not obsessed, that is good practice everywhere. 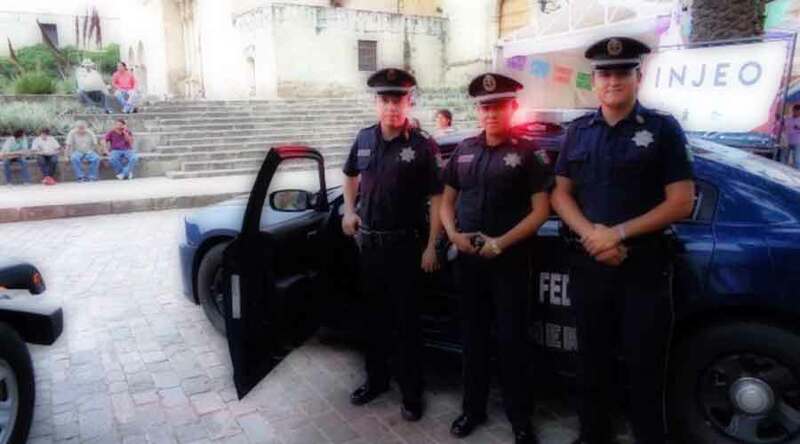 Comparing Oaxaca safety to other cities in the U.S., Oaxaca is much safer. The people of Oaxaca are very politically engaged, therefor, protests in the city are very common. Protests in Oaxaca are not like in the U.S. where people need to worry about violent clashes or cars ramming into protesters. I don’t recall a single protest that has turned violent in Mexico, not to say it’s never happened, but I don’t have personal knowledge of this. Protests in Oaxaca are normally held by union workers, mostly the teacher’s union protesting education reforms and pay. They do block streets, which can be an inconvenience, so when in a taxi you need to leave the taxi, walk through the blocked road and catch a taxi on the other side of the protest, but there isn’t fear of being assaulted by protesters as you walk by. They block roads to make a point. You have probably seen these protests reported and had concerns, but no need to worry, they are just using their right to protest peacefully. Carry minimal amounts of cash. If you are traveling with large amounts of cash, utilize the safe at your hotel, but don’t keep it in your possession at all times. Leave your hotel with just what you need. Use credit cards as much as possible. I know that is easier said than done because Mexico is still a cash society, but credit cards are safer than cash in your wallet. Don’t wear jewelry. Just leave the jewels at home, including the diamond wedding ring if you can handle that. Don’t wear designer clothes. I know, you want to look good in your Instagram photos, but there is a line between looking good and being a nice target for robbery. If you look rich, you will probably be appealing to thieves in a country where more than half of the people still live in poverty. Don’t walk the streets at night. I have been robbed twice in Mexico (not in Oaxaca), both times were after midnight in the streets walking home from bars. Take a taxi at night, even if you are just going a few blocks. Don’t be involved in the drug business. Don’t deal and don’t be friends with people who deal. Make copies of your passport (the front page with your photo) and keep this in your wallet. Leave your actual passport in your hotel. I have been in Mexico for a decade and the only time I have been asked for my passport is at the bank. So if you don’t plan on banking, don’t carry your passport around with you. If it is lost or stolen, it’s an ordeal to replace it. Make copies of your credit cards and leave those in your hotel, in your luggage, not out for the maids to see your credit card number and name. You can also keep scanned copies on a USB drive. I do this and keep copies of all my credit cards (front and back) and all my IDs (visa, passport, drivers license). It makes things much easier if you are robbed and need to report those items stolen.